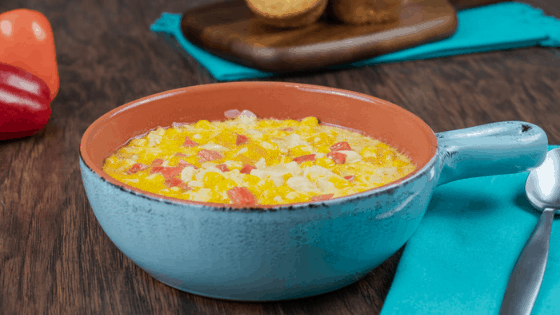 Corn and Pepper Soup is perfect for Spring and Summer. It’s filled with delicious sweet peppers and super sweet corn. There’s a version for Instant Pot and a version for the stove top! When making this in the Instant Pot it takes less than 30 minutes! It’s perfect to make to go along with a summer meal and it’s so simple to make! This soup has mini sweet peppers, super sweet corn, potatoes, garlic, and heavy cream. The result is a creamy and smooth soup! I added directions to make this soup on the stove top but it does take a bit longer to make. It’s still easy enough but you will have to “babysit” the stove per se, and stir occasionally. To make it on the stove top, the ingredients do get added in a different order to make sure that the peppers, potatoes, and corn are the right texture and consistency that making it the Instant Pot would create. For this corn and pepper soup, I used mini sweet bell peppers. You can use bell peppers in place of the mini’s but the flavor will be different than what I was going for with this soup. By using the mini sweet bell peppers, it gives this soup a refreshing sweet flavor that pairs perfect with Spring and Summer dishes. I used frozen super sweet corn as well to keep the flavors balanced with the mini peppers. I peeled and diced up 2 medium sized potatoes for this recipe and it make this soup deliciously creamy. Adding the the heavy cream make this soup a little thicker and incorporated all the flavors together well. Set Instant Pot to SAUTE and add butter. Stir in the mini sweet bell peppers, potatoes, onion, and garlic. Press CANCEL and add in the chicken broth, salt, and pepper. Close the lid and set to MANUAL/PRESSURE COOK for 5 minutes. Allow a 5-minute Natural Pressure Release and then remove the lid. Set the Instant Pot back to SAUTE and add in the super sweet corn and heavy cream. Saute for another 3 minutes, serve. Heat a dutch oven or large saucepan over medium heat on the stove top. Melt the butter and add in the mini sweet bell peppers, onion, and garlic. Allow simmering for 3-5 minutes. Stir in the 2 cups of chicken broth, corn, and potatoes. Reduce heat to low and add in the heavy cream. Cover and simmer for about 15 minutes, stirring occasionally.